she sees. Her ex-husband is getting remarried, her teenage daughter hardly needs her anymore, and the career she once dreamed about has somehow slipped from her grasp. She’s almost lost sight of the spirited and optimistic young woman she used to be. What I Say....I have such a love/bore relationship with Maria Murnane's books. One night as I surfed the internet searching for something to read, Amazon suggested that I read "Perfect on Paper", the first book in her Waverly series. I only made it through the first book in the series because it was just such a weird read for me. There were parts that i really liked, then parts that felt so amateurishly written that they actually grated on my nerves. The Honey notes especially just bugged me to no end. But there was enough about it that I liked, that I took a chance on one of her books that I saw on NetGalley, called Katwalk (see my review here). And I really liked that book. I thought, yep, she's hit her stride, and now I'll watch for her. 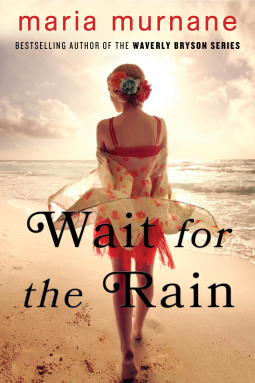 So when I received a copy of Wait for the Rain from NetGalley in exchange for an honest review, I was feeling pretty positive about it. However, this book turned out to be pretty uneven, reminiscent of the Waverly book. It started so slowly, and the dialogue felt very hokey. About halfway through, it picked up, and I wanted to follow it through to the end. The storyline was good, and the setting was great, I just really struggled with the dialogue.